Is Super Mario Odyssey Getting its Own Brand of Cereal? Over the last few years, we’ve heard some strange rumours about Nintendo and their games. We’ve heard one about a Mario movie by Illumination Entertainment, creators of the Minions and Despicable Me. We’ve heard comments that a potential Super Smash Bros Melee remake could be in development, based on a mysterious trademark. And well, where the true rumours are concerned… that’s its own kettle of fish. Like how Super Mario Odyssey has realistic looking worlds you can explore in a sandbox style similar to Mario 64. How Team Rainbow Rocket is actually a thing in Pokémon Ultra Sun and Ultra Moon. Or even perhaps how Mario + Rabbids Kingdom Battle exists at all. Those are all real things we were skeptical about ourselves. So truth really has become stranger than fiction, and the line between rumours and reality for Nintendo games is now so thin it’s almost non-existent. But it seems the lines aren’t blurred enough yet. Because even by these standards, today’s rumour is something else entirely. Why? Because it’s not even game or media related at all. It’s about Super Mario Odyssey branded breakfast cereal. Yes, breakfast cereal. 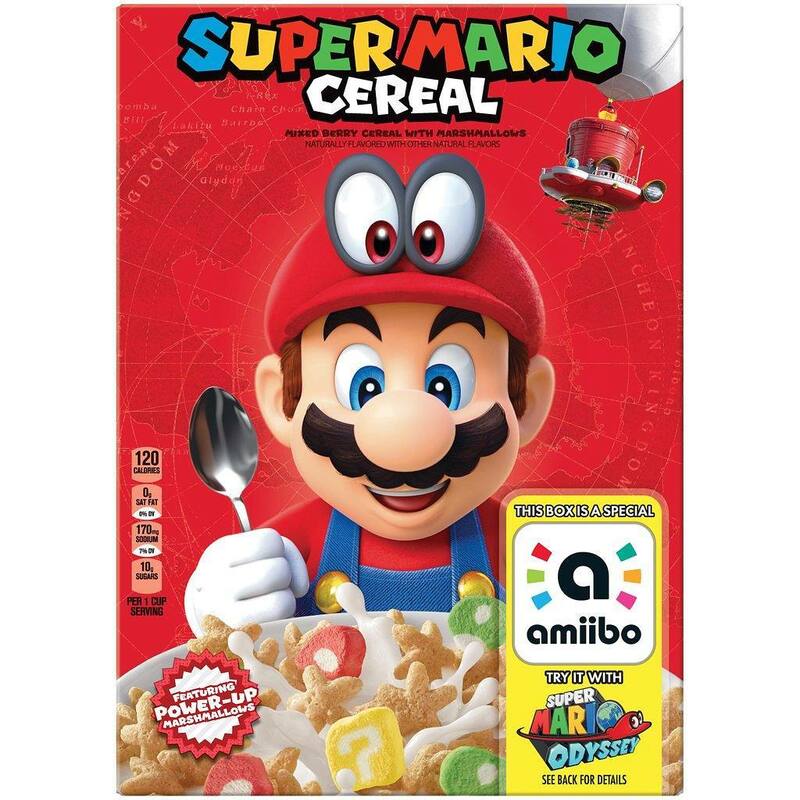 As in, the rumour suggests that Nintendo and Kellogg’s are teaming up to produce cereal based on the game, complete with amiibo stickers found in the box. It’s the kind of insanity you’d be laughed off the internet for five years or so ago. Yet there’s actually evidence for it this time around. So here’s the post about it on Cerealously (a blog dedicated to breakfast cereal). It’s all surprisingly convincing so far. And the blog has leaked this sort of announcement before. But is it real? Is Nintendo really planning to continue the Nintendo Cereal System’s legacy more than 20 years on? Well, it’s really hard to judge at this point. Remember, this is a world that’s gone completely mad. It’s one where the lines between fiction and reality basically don’t exist anymore, and where every ludicrous idea under the sun seems to be happening at once. And that makes it very hard to judge anything anymore. There’s no baseline for what’s plausible and what isn’t. So like with a scientist trying to debunk conspiracy theories while the rapture, an alien invasion, a zombie apocalypse and a robot war are all happening at the same time… We just can’t figure out any logical way to differentiate between a crazy fanboy forum post and a credible rumour any more. Hence we’ll just wait and see for now. Given everything else that’s happened in the last few years, the idea of a Nintendo cereal in the 2010s is more plausible than it’s ever been beforehand, so we’ll assume the best possible outcome and say Nintendo really is working on one. But hey, what do you think? Could Super Mario Odyssey really be getting its own brand of cereal? Are Nintendo’s franchises about to enter the food business? Post your thoughts on the matter in the comments below or on the Gaming Latest forums today!